Many of the great historical cultures had one common supplement which they relied on to ensure strong mind, body, and spirit: fermented fish/fish liver oil. Roman soldiers were given a daily ration of fermented fish/liver oil. The Scandinavian Vikings had a drum of fermenting cod livers outside the doors of their homes. Grandma always had a bottle of cod liver oil in the back cupboard. Green Pasture is proud to bring you fermented cod liver oil for the first time in 100+ years. Green Pasture uses a proprietary cold process extraction and cleaning method to produce this pristine and naturally fresh cod liver oil. You will taste the difference, and you will feel the energy! 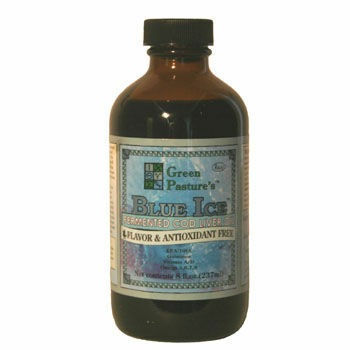 Blue Ice Fermented Cod Liver Oil is batch-processed and independently tested to international purity standards. You will find Blue Ice Fermented Cod Liver Oil is thick, rich, and full of pigment and naturally-occurring nutrients, just as historically treasured. Dr. Price discovered a strong healthful synergy combining cod liver oil and high vitamin butter oil. Always take cod liver oil with high vitamin butter oil for maximum effectiveness. For more information on the work of Dr. Weston A Price, visit www.westonaprice.org. Vitamin A: 3500 IU's min. Vitamin D: 600 IU's min.